The screenshot above is hosted and provided by tabbles.net. Please contact them directly for any copyright infringement as we are not responsible for that content. 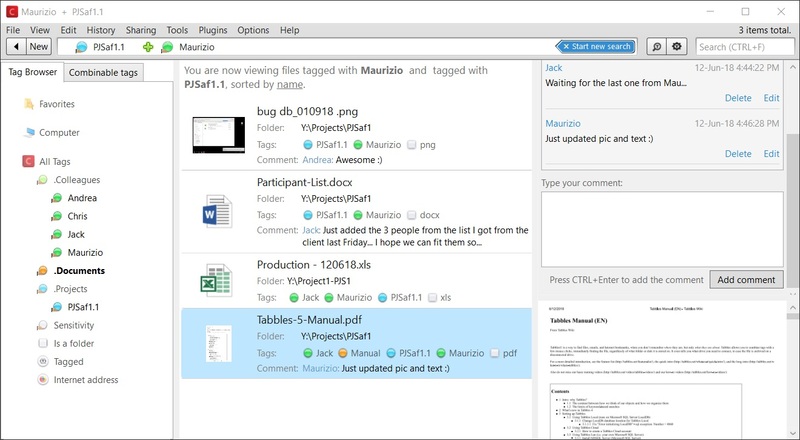 Tabbles lets you use tags like virtual folder and tag with your colleagues, on local drives, shared drives and in the cloud. Features: visual tag, auto-tagging, user management Outlook and Chrome plugin, Cloud storage support, Windows integration. Group your files on the fly: Tabbles allows you to instantly sort or group your files independently (or dependently) from the folder structure. Sorting is performed on the basis of the attributes given to each file - which in turn means that you can group and sort files by clicking on the tabbles that best describe them. Find your files by what your remember of them, instead of their name or where they are: often you can't remember where your files are, but you remember what they are about...that's all you need to find tha, with Tabbles. Redundant files and duplicates: you won't need to worry anymore about finding out if and where a copy of that given file was being used. Nor you will need to clean up folders from redundant copies anymore, because you won't need to copy or move your files around anymore. File management workload: as your disk will be cleaner from copies, the need to"clean up your hard drive" will be considerably reduced, if not eliminated. As a lot of the file management is done to organize your files and folders, using Tabbles you will forget about this.